President John Quincy Adams laid the corner stone for the Cincinnati Observatory in 1843. The former President was 77 years old and in poor health but felt this such an important event he made the difficult trip to Cincinnati. President Adams was deeply interested in astronomy which made his speech inspiring who all those present. It would be the last he would make in public. This small observatory located in Southern Ohio would be part of the foundation America would build its astronomy program upon. Can you image how clear the skies must have been in rural Ohio in 1843. While electric lights were not a factor there were other influences to darkened the night sky. Cincinnati was growing daily and the combination of river boat traffic and manufacturing filled the city skies with thick dark coal smoke. By 1873, just 30 years after the laying of the corner stone, the Cincinnati night sky had become so polluted that it was no longer suitable for an observatory, and it was decided the structure should be moved to its current location. The original cornerstone laid by President Adams was transferred to the new sight on Mt. Lookout. After $3,000,000 restoration the observatory now stands as it appeared in 1873. It is one of the oldest observatories in America. When visiting the site you will wind through a lovely neighborhood and then turn onto Observatory Place. This short road is lined with turn of the century gas lamps directing upwards toward the observatory. Its large wooden doors open into another century. Careful restoration has brought back the warmth of wooden floors and plastered walls that have the look of granite. There are mahogany bookshelves and of course the old telescopes, some dating as far back as 1845. Also included in the collection is the original 22' telescope installed in 1904. The observatory is now an education facility with tours and open viewing. 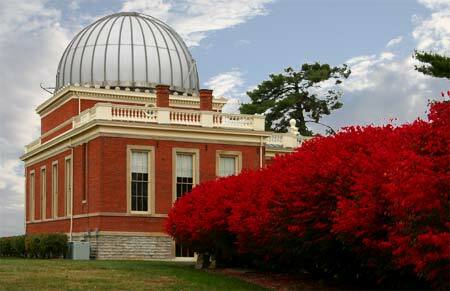 The Cincinnati Observatory continues to offer stargazers the opportunity to witness the night sky year round on most Thursdays, Fridays and Saturdays. 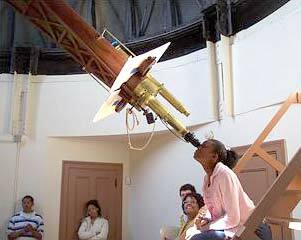 As a Historic landmark the observatory also offers historic tours during daylight hours. Please call ahead as times change with the movements of the sky. A perfect spot for any occasion! The Observatory and grounds are available for a wide variety of events; weddings, reunions, cocktail parties, catered dinners, business, motivational meetings, etc. Please call the Observatory for additional info and to register.